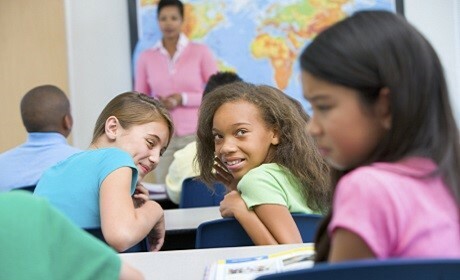 What is Elementary School Bullying? As children move through elementary school, their peer relationships take on greater influence and they begin to congregate in areas where adults may not always be present (in the bathroom), or where they can be easily hidden from view (in the playground). The physical bullying that was common in the preschool years may turn more into social bullying and exclusion, which is harder for adults to see and often, harder for kids to talk about. Bullying behaviour may include: name-calling, pushing, giggling or making faces when another child talks, excluding a child from a game, ignoring a child, tattling to get a child in trouble, using a child’s name as an insult, making a point not to sit or line up near a certain child, or writing negative messages on the internet. According to one of the world’s leading researchers on bullying, 60% of boys who bully others in elementary school had criminal records by age 24. Does your child seem unusually anxious? Is your child worried about going to school, or complain regularly of headaches and stomachaches? Does your child have problems with aggression or appear to lack empathy? Does your child have friends who are aggressive? Bullying is a serous issue for today’s youth and one that requires adult intervention. While parents cannot protect their children from every danger that life may present, there are a number of things they can do to foster the proper skills needed to create and maintain healthy relationships and stop the violence of bullying. Stop, Listen and Stand Up! One of the single most effective things a child can do to stop the violence of bullying is to tell an adult. Kids may not feel comfortable talking to you about being bullied. They could be embarrassed or scared that telling someone will make the problem worse. It takes a lot of courage for a bullied child to come forward. Be sure to give your child your full attention and ask for details about the bullying: How often does it happen? How long has it been going on? In how many places does it occur and how has it affected you? Stand up for your child - report the bullying to other adults in your child’s life (teachers, coaches) and work together to give your child the support he/she needs to develop healthy relationships. Read more about the questions you can ask when talking to your child's teachers or school administration. Research shows that using aggression to deal with aggression usually makes the problem worse. Teach your child how to stand up for him/herself by rehearsing phrases and words such as, “STOP!” until they sound confident. Reassure them that walking away and reporting a bullying incident is the best thing to do. Parents need to be aware of the dynamics in children’s peer groups. It is extremely important that parents provide an environment that promotes positive friendships and reduces negative interactions; parents need to ensure all children are included and that bullying behaviour does not flourish. Consider enrolling your child in various activities in and out of school so they can experience many different friendships. Make connections with other parents so that children’s peer interactions can be monitored. Children who are bullied often have low self-esteem. Find activities they enjoy so they can start to feel good about themselves. For children who bully, provide opportunities for them to use their natural leadership skills in a positive way (e.g., teaching siblings and younger children a new sport or skill). Parents set the tone for family relationships and children learn relationship skills by watching their parents’ behaviour. Practice tolerance and model the use of positive power by respecting and supporting others. Encourage positive relationships among children by praising respectful and inclusive behaviour whenever you see it. Try and focus on the positives of your child, even when they need correcting. Parents must set guidelines, limits, and consequences for unacceptable aggressive behaviour – whether it’s at home, on a sports team or at school. Consequences should teach children that bullying behaviour is wrong and should show children how to use their power in a positive, rather than destructive way. Refer to our list of Consequences and Empathy Tips for more help. Dr. Pepler talks about how parents can instill confidence in their child. Dr. Pepler talks about tips for helping your child deal with aggressive kids.